The mysterious Gree starship known as Gray Secant carries a long and unclear history. According to the Gree, this fully-automated vessel was launched by their ancestors at some point in the distant past, though conventional sensor technology has been unable to determine the ship's precise age or even its composition. As a result, there is no way to know the ancient starship's capabilities for certain, though most experts believe its technological sophistication to be well beyond contemporary Republic and Imperial science. Among the Gree themselves, Gray Secant carries an almost religious significance. The ship was sent out from the Gree Enclave to explore and analyze the rest of the galaxy over the course of many millennia; getting to see one of their ancient legends at work firsthand is understandably exciting for the Gree. 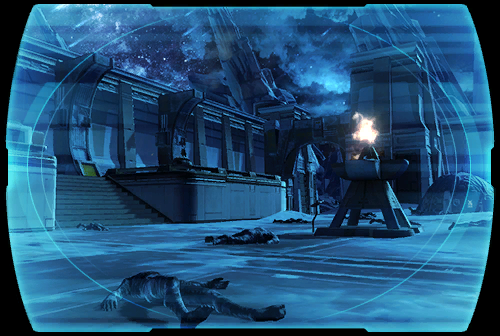 In the early days of the Empire's invasion of the planet Ilum, Republic forces at the Fray Landing Base fought desperately to hold their position against an overwhelming tide of Imperial attackers. Though they were eventually overrun and killed, these brave heroes of the Republic have not been forgotten by their comrades, who have since placed a humble memorial to commemorate the many lives lost at the site. "Remember Fray!" became a rallying cry among Republic troops and the public alike, allowing the then-newly elected Supreme Chancellor Saresh to press for the largest increase in military spending since the Treaty of Coruscant. Composed of survivors and outcasts from dozens of defunct pirate groups from around the galaxy, the Tonvarr have banded together under a simple Weequay battle principle: "Enter with the best weapons, leave with the best spoils." Tonvarr raiding parties have struck weapon manufacturing centers, xenotechnology research labs, and even ancient dig sites, gathering the most impressive arsenal of advanced and exotic weapons technologies in the entire galactic underworld. The group's intelligence gathering abilities are also far beyond the level of other pirate organizations; no one is entirely sure how the Tonvarr have the expertise to locate and make use of such a wide variety of complex technologies. It's possible that their broad knowledge is a side effect of the group's diverse membership: raiders from many different species have been spotted among the Tonvarr ranks.